Legend tells there was a gang of clackers (hackers of Victorian era machines) that devised a predictive card-counting algorithm that used to send many casinos into ruin. Inspired by this legend, another group of gamblers, the team at Gambler's Warehouse, have launched a new and stunning deck of cards: Steampunk bandits. 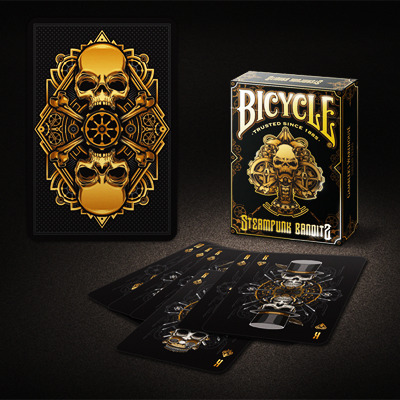 Mixing skull, gears and many other artifacts, the designs of every card in this deck will captivate. A magnificent work in a dark and highly detailed deck that reveals some kind of disturbing atmosphere thanks to the mix of gold and silver tones and a black background. This project has been widely funded, enough to unlock a second deck, the White Edition, limited to 2,500 decks and completely customized too.